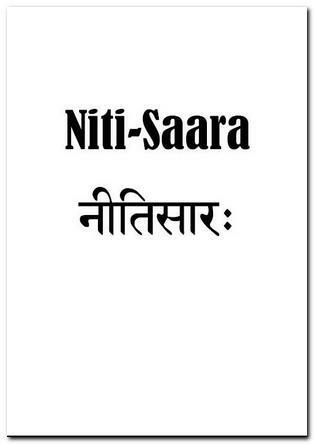 Niti-Sara is a collection of Subhashitas from Sanskrit literature. The Subhashitas are Sanskrit verses that are full of wit and wisdom. Neeti or Niti is art of doing the right action at right time and place. This booklet is an English translation of a small booklet in Malayalam which has been in use in Kerala for decades. Can you give me full shloka? Can you believe – I got it by Google search on “कन्या वरयते kanya varayate” ? Internet is awesome!! There was a small mistake, which I have corrected. रूपं was typed as रुपं, it was short रु instead of the long one. मिष्टान्नम् इतरे जनाः = others are happy for the feasts !! Translation is mine. I hope it is in order. That was in earlier eons. Now everyone’s ”Varayate’ is with the Maata, i.e. Vittham. The other day I saw a scene in a new Malayalam film, where the boy when told by her of her love towards him, he says: I do not have even a mobile or a two-wheeler bullet, how can you love me? !!! Nice website with so much free downloads. Should be supported by Govt.- through donations for encouraging e-learning of sanskrit. Sanskrit the deva bhasha of our land and our most coveted language is being patronised by this website through allowing free download of classic e-books of the language. Must get incentive from Govt.- for popularising sanskrit. NICE WEBSITE. I have been student of sanskrit for many years. Nameste! Happy to see the ebooks. Iam a PG in sanskrit and a lecturer in a college. I intend to do Phd in sanskrit. I would like to have the sundarakhanda portion from the Raghuvamsa and few others I’ll give my options every now and then. Pl co-opoerate. thank you. There are lot of -eternal- full of senses- subhashitas in sanskrit. prabhushch kshamayayukt- One having might but has power to forgive and 2nd-Poor yet donating whatever small he has! There are 6 secrets of friendshio- i remember 2nd line–} Bhunkte bhojayate cha ev-Guhyam akhyati pucchati–shadvidham priti laxanam! ?? First line? The other sloka is there in Panchatantra. ददाति प्रतिगृह्णाति गुह्यमाख्याति पृच्छति । भुंक्ते भोजयते चैव षड्विधं प्रीतिलक्षणम् ॥ – पञ्चतंत्र, मित्रसंप्राप्ति. It was on my Lips for long- But could not recollect. Namaste ! During my childhood I have heard a पद्यम् which lists the items that should not be revealed to others unnecessarily .Perhaps the list contains five items. These items are: one’s age (आयुः),one’s income or poverty (वित्तम्), the confidential events that took place in a family (गृहविषयम् ), amount donated on charity (दानम्) and one’s weakness or illness that can be inferred from details of medicines being consumed (औषधम्).Perhaps the पद्यम् ends as पञचैते न वक्तव्यानि . Can you give me the full पद्यम् and tell in which collection this finds a place ? There is subhashita similar to the one you are looking for. The above subhashita is there in Nitisara. But, I have no idea about its real source. Thank you for your immediate and kind reply. I distinctly remember that the पद्यम् begins with आयुः,and it does include दानम् and औषधम्.I have asked many knowledgeable persons and also made attempts to search मनुस्मृतिः, नीतिशतकम् ,चाणक्यनीतिः विदुरनीतिः and Niti-sara.I am not able to reconstruct the पद्यम् from my memory. If anybody can throw light on this, I will be happy. श्लोक 129 to be precise. Please suggest sanskrit names for tree (vriksha). क्षितिरुहः, महीरुहः, भूरुहः, फलग्राही m. (न्), फलदः, पल्लवी m.
held in veneration,’ चैत्यः; ‘relating to a tree,’ वार्क्षः -र्क्षी -र्क्षं. I’m unable to recall a niti vachan with meaning that every relation in this world is attached to you because of their own intrests.I read it in 1987 in UP Board sanskrit book.Can u provide it in sanskrit as well as its meaning.It referred to all relations-mother,father,husband,wife etc.etc. Simmi, It is from Brihadaranyaka Upanishad 2.4.5, in the dialogue between yajnavalkya and Maitreyi. The Mantra is given below. Madhumita Gupta, Giving below the subhashita with translation. Great virtuosities in a precise form. That is what the book is. I want to full details for “Nithi – saara” sanskrit book. Like, who is the writer? Who is the did English translate? And when did him(sanskrit writer) got the that shubhashitha? (sholoka) can you place give that details quickly? Thank you. Nitisara is a compilation of popular subhashitas. Most of these subhashitas are from classical Sanskrit kavyas and Puranas. Its compiler is unknown. Nitisara is very popular Kerala, South India and has been in print for more than hundred years. Its English translation was done by me based on a Malayalam translation.